The CEO of a public utility company said something in an interview that has stuck with me over the years: "Problems are my friends." His point was that problems inspire solutions that fuel progress. As consultants and designers, problems also generate demand for our services. But often problems are just problems. I've worked with A/E firms that have been wrestling with the same problems for years without real resolution. How can this be? A large part of it is the difficulty in changing organizational cultures and entrenched behaviors. Habits are hard to break. 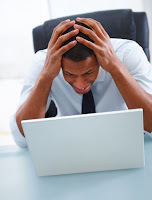 Firm executives also frequently fail to address the root cause of problems. It's like mowing down dandelions in your yard; until you kill or remove the tap root, they keep coming back. The dysfunction in companies persists because well-intended solutions target symptoms rather than the underlying disease. If you have such problems in your firm, perhaps it's time to apply some root cause analysis (RCA). RCA is simply a formal process for identifying and addressing the root causes of problems so that their recurrence can be prevented. Root causes are not always readily evident, so it takes some concerted effort to, well, root them out. A lot of misguided corrective actions fail because the root of the problem is not adequately identified. For example, let's say that despite this tough economy your firm is struggling to get project managers out to sell. You define individual goals, organize weekly sales meetings, and step up the pressure on PMs to make their assigned sales calls. But selling activity increases little. Many firms tackle this common problem by doing sales training. There is certainly value in training, but does it address the root cause? Probably not, because on the surface it would seem to be more an issue of motivation or availability than ability. The place to start to address this problem is to uncover why PMs aren't making more of an effort to generate new business. A popular tool for conducting RCA is what's known as the Fishbone Diagram. This provides a quick visual representation of likely causes and their relatedness. This process is most effective with at least 2-3 people familiar with the problem. In the Effect box, write a brief description of the problem you're trying to solve. Write category titles for the four main branches of the diagram. You might choose the ones depicted above, as they are the most common: Equipment, People, Process, Culture. On the horizontal lines, write suspected causes within each applicable category. You are encouraged to draw angled lines for sub-causes (or the underlying "why"), when appropriate. Review the possible causes you've identified and select those few that most likely have a significant role in contributing to the problem. Important: Look for correlations between causes (in other words, causes that likely interacted with one another). 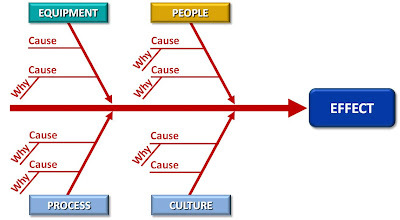 You may want to subject each of the selected causes to further analysis, applying the "5 Whys" process, which I'll cover in my next post. This list of causes might seem a bit overwhelming at first. There's a lot to tackle here. But not all of these are root causes. Some are symptomatic of underlying factors. Some issues are more important to address than others. To condense the solution down to a more manageable--and effective--level, you need to dig deeper in uncovering root causes. Productivity pressures. The firm understandably stresses the importance of meeting utilization goals. This is reflective of both the historic culture and the primary performance metrics. But the best solution for the current productivity struggles, of course, is increasing sales. Yet the firm seems to have inadvertently put these two objectives in conflict. Inadequate business development process. A/E firms often have a rather piecemeal approach to generating new business, and that seems evident here. PMs aren't clear about how to proceed, aren't sure what the market opportunities might be, need help identifying leads, find the CRM system more a burden than a help, and are unaccustomed to being counted on in a big way to generate sales from new clients. The overall BD process needs further refinement. Ineffective sales skills. There is also evidence that some training is probably warranted. The PMs indicate uncertainty about how to sell, and a corresponding lack of confidence. They don't seem to recognize their role in gathering market intelligence and uncovering sales leads. These issues can all be addressed through training and ongoing coaching. By grouping the initial list of causes this way, the problem begins to look more manageable. But there's still need for further analysis. That will be the subject of next week's post.